Provide seniors with a living environment similar to hotel complexes, where our residents’ quality of life and their uniqueness are the focus of our concerns. The complex management upholds this mission by providing a vibrant living environment, a high-quality meal service, a housekeeping service, a security service, a meticulous preventative health service, and a team of attentive, qualified professionals. Respect of people’s uniqueness, their quality of life, security, family, honesty, their right to information, residents’ responsibilities and respect of employees, without whom the Château wouldn’t be able to accomplish its main mission. THE CODE OF ETHICS ESTABLISHES THE EXPECTED PRACTICES AND CONDITION OF THE COMPLEX’S STAFF TOWARDS ITS RESIDENTS. IT ALSO STATES THE RESIDENTS’ OBLIGATIONS. Staff providing services to residents must respect residents and residents’ friends and families, as well as their own work colleagues. When addressing residents in French, staff must use “vous” and call the resident by their surname using “Monsieur” and “Madame” at all times, unless the resident expressly states that they wish to be addressed with “tu” and called by their first name. Staff must treat residents and provide them with services in a warm manner, i.e., gently, friendly, politely, and courteously, but never in excess. Staff must also always be fair. Staff must dress appropriately and decently. Staff must provide assistance to representation and to appeals. Staff must facilitate obtaining the right to information, support or assistance for the resident’s family, or for any other person the resident choses. Staff must give residents access to their files and the necessary explanations in order to properly understand the content (resident or their legal representative). 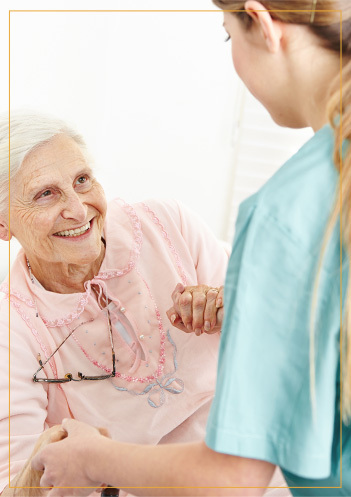 Staff must facilitate the maintaining of contact between the resident and the world outside of the complex. Staff must facilitate the expression of any opinions, criticisms and suggestions the resident may have about life at the complex. Any information regarding residents must be treated as confidential. Staff must not, under any circumstances, divulge information about the private life or state of health of a resident for anything other than that which is required by their work. Staff must ensure complete discretion towards residents, and must never voice their concerns in their presence, or aloud. Staff must avoid personal conversations, as well as information about family and financial difficulties, work problems and internal management. Staff must be extremely discrete with the information they receive and must never divulge the content. An operator or one of their members of staff who is not the spouse or close relative of a donor or testator cannot accept a donation or inheritance if the donation or inheritance was made while the donor or testator was treated or received services at the complex. Staff cannot make solicitations to the residents.